Boucheron Pour Homme men's perfume is a true classic, with a luxurious and intense fragrance that opens with aromatic freshness and gradually turns into a spicy woody scent. 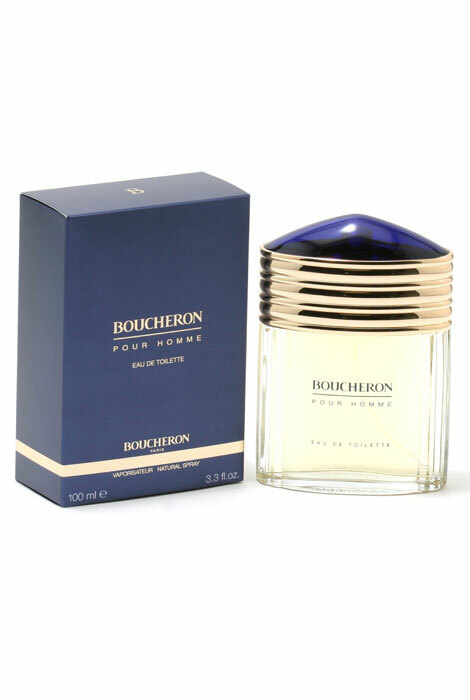 Boucheron released in 1991 is made for the elegant and refined man. Classy and versatile, it opens with lemon and herby verbena that lasts for a long time and feels refreshingly lovely on the skin. At the heart, a soft floral scent leaves a delicate trail of romance and love. It then evolves into woody, spicy base and maintain its regal power with ease throughout. Boucheron comes in a classic and an elegantly constructed bottle that not only looks manly and sophisticated but contains a magic potion inside that will lure them with its powers. Features top notes of Basil, bergamot, lavender, lemon, mandarin and verbena, middle notes of Carnation, jasmine, lily, orris root and rose and base notes of Amber, benzoin, musk, oak moss, sandalwood, tonka bean and vetiver. 3.3 fl. oz. EDT Spray. No express shipping. No shipping to PO boxes.